The Palmer Arts Council is sponsoring “a conversation between poems and music” at Vagabond Blues in Palmer, Alaska, Saturday September 21 at 7:00 pm. Music by the Northern Aurora Flute Ensemble. I’ll be reading from my new chapbook “Unbound: Alaska Poems” published by Uttered Chaos Press. 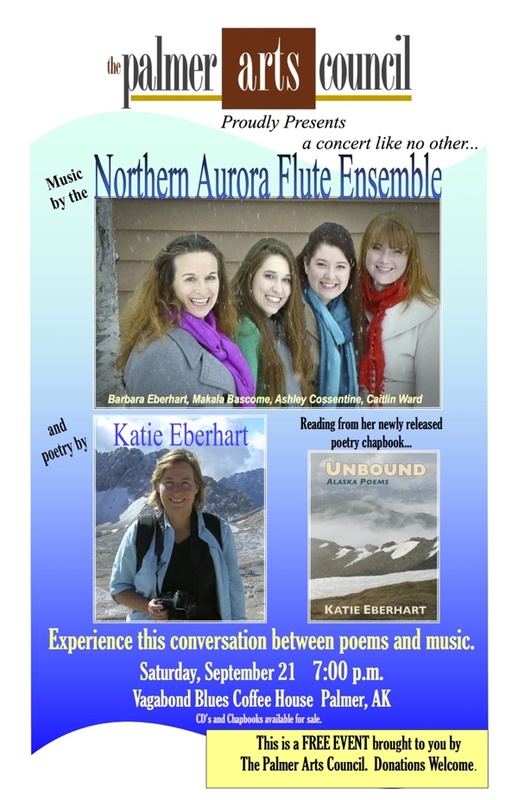 This entry was posted in Books, Events, Unbound: Alaska Poems on September 12, 2013 by katie eberhart. I’m looking forward to it, too. See you Saturday! Where is the Nobility in Accidental Death? © 2012-2018, KATIE EBERHART. ALL RIGHTS RESERVED. All content on this blog is © Katie Eberhart unless otherwise noted. Feel free to link to any item but please don’t copy or use without permission.